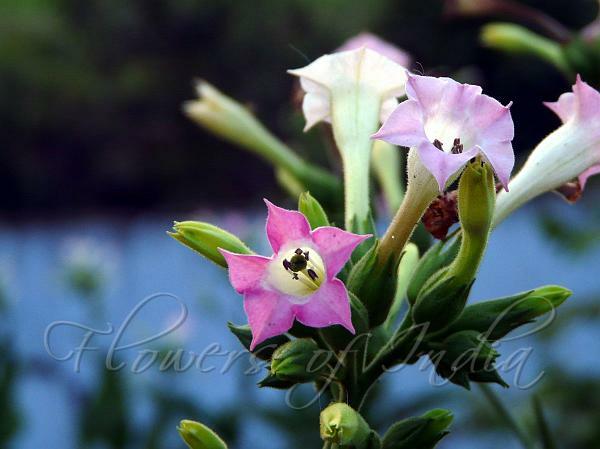 Tobacco, a native of Tropical America is the plant that is cultivated as the principal source of tobacco. Tobacco leaves are often smoked in the form of a cigar or cigarette, or in a smoking pipe, or in a water pipe or a hookah. Tobacco is also chewed, "dipped" (placed between the cheek and gum), and sniffed into the nose as finely powdered snuff. The Spanish word "tabaco" is thought to have its origin in Arawakan language, particularly, in the Taino language of the Caribbean, said to refer to a roll of these leaves or to the "tabago", a kind of y-shaped pipe for sniffing tobacco smoke , but Sp. 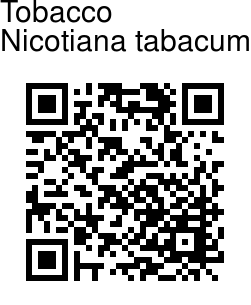 tabaco was commonly used to define medicinal herbs from 1410, originating from the Arabic "tabbaq", reportedly since the 9th century, as the name of various herbs. The word might then be European, and later applied to this plant from the Americas. Nicotianas are beautiful plants, growing to between one and two metres in height depending on the variety and growing conditions. They have huge green leaves and very sweet-scented flowers which range in colour from white to purple, through pink and red, for N. tabacum. They are straightforward to grow. Tobacco contains the alkaloid nicotine, a powerful neurotoxin that is particularly harmful to insects. All means of consuming tobacco result in the absorption of nicotine in varying amounts into the user's bloodstream, and over time the development of tolerance and dependence.